What Alisa has desired for five thousand years has finally come true: She is once again human. But now she is defenseless, vulnerable, and, for the first time in centuries, emotional. As she attempts to reconcile her actions as a vampire with her new connection to humanity, she begins to understand the weight of life and-death decisions. Can Alisa resolve her past and build a new identity, or is she doomed to repeat her fatal mistakes? So the summary here really doesn’t let you know what really is going on in these three books. This volume centers around Alisa being human, but only for a short time. Why and how does she turn back into a vampire? Well, she uses a technique what was introduced in the previous vilume using some old vampire blood. And she does this so she has a fighting chance against her daughter. Yes, my dear readers, Alisa gets pregnant and has a kid. But this of course is no ordinary kid. And her daughter, Kalika, likes ot kill and feed. And she is determined to find Paula, and her newborn son, John. Paula turns out ot be a reincarnation of Suzama, Alisa’s mentor in ancient Egypt, and there is the implied idea that John could be Jesus Christ, reborn. Alisa constantly grapples with her moral dilemma: to killor not to kill her daughter? In the sad end, it is revealed that despise Kalika’s seemimgly hungry and evil ways, she was doing the right thing. And paid the ultimate price. This takes place over the course of two books, and the third book, is where it gets interesting. Alisa, in some very bizarre way, has a chance to go back in time. And we meet Dante. And Alisa has to undo a very big wrong. In the end, she gets the chance to go further in time, to the time when she was still human, 5,000 years ago in India…and where she doesn’t turn into a vampire. So that is a great ending. Cause how can you miss something (being a superpowerful vampire) if you haven’t experienced it in the first place? But for some reason, the series is continuing on…..!!!! SPOILERS! Danger Will Robinson! Danger! SPOILERS! What. The. Heck? Seriously folks. That last book in the omnibus might as well have not even happened. And in this new book, it didn’t. It happened in Seymour’s writing. Apparently, from what I understood, Alisa has been telepathically linked to Seymour and giving him the idea for his books about her. Is this a cop-out? Yes! Gah, this drove me nuts the entire time I was reading it. And Seymour is a famous writer now, but sort of a recluse because he writes under different names, and has never revealed who he is. When this was brought up, I couldn’t help but think if Mr. Pike was poking fun at himself. But anyway…Notice how her eye color is different in the covers. Here, her eyes are blue. Which I guess has some significance considering all the stuff that probably did not happen in the other books, but still did, in some weird way. And the plot! The plot! I couldn’t wrap my head around it because I just didn’t get it. It wasn’t as interesting as the other books, and it all leads to one thing… Alisa living, but in Teri’s body! So that is where Thirst #4 will pick up, which comes out this summer. Plus, this took me awhile to read, longer than I would have liked. At one point, I considered just stopping, which rarely happens. There was also a really long and drawn-out scene where Alisa comes back to her place and has to save herself from someone who is trying to kill her. It felt like something that belonged in a Tom Clancy book. I just kept skimming it. Oh and the big bad that Alisa was fighting? There were two of them. One which was some sort of government operation, and the other was a bunch of Immortals. Yep. Immortals. One of whom Alisa has a thing for….The question was: which big bad was the lesser of two evils? Well that remains to be seen. I think I will still find myself reading the new book this summer, no matter what, despite all this negativity I feel towards this new book. I mean, I never read Pike when I was younger so I’m curious to know how die-hard Pike fans feel about this revitalization of the series and how they feel about these new books. Anyone? Because even I’m not too happy with it. But despite all this, the one thing that really gets me interested in these books is Sita’s spirituality. The conversation never stops and it is rather enlightening. Yeah, we have vampires like Angel who try to do good because of all the bad they did, but Sita is a vampire who just takes it to another level. And I admire that in these books. 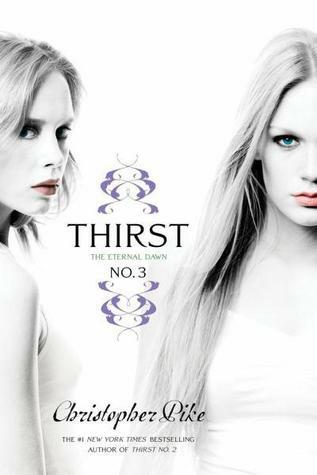 So that is why I will most likely read Thirst #4. I haven’t read your review for it, because I’m still debating if I should get them. Everytime I see them at the bookstore I want to buy them, but then I remember I don’t have a lot of free time! They are thick! I LOVED this series! I first read it in the 90s (I think it was called the Last Vampire) and was completely blown away. I loved how complex and spiritual she was, especially all of the crazy mythology about vampires. Definitely not your run-of-the-mill vampire story. So glad to see this series getting another chance!